For the less NERD!-esque among you, the Na'vi are the species from James Cameron's Avatar. There is no significance to this choice beyond wanting to put a made up language in there and not feeling like going with Klingon. As one may recall, Nanase's mother is the sister of Tedd's mother. 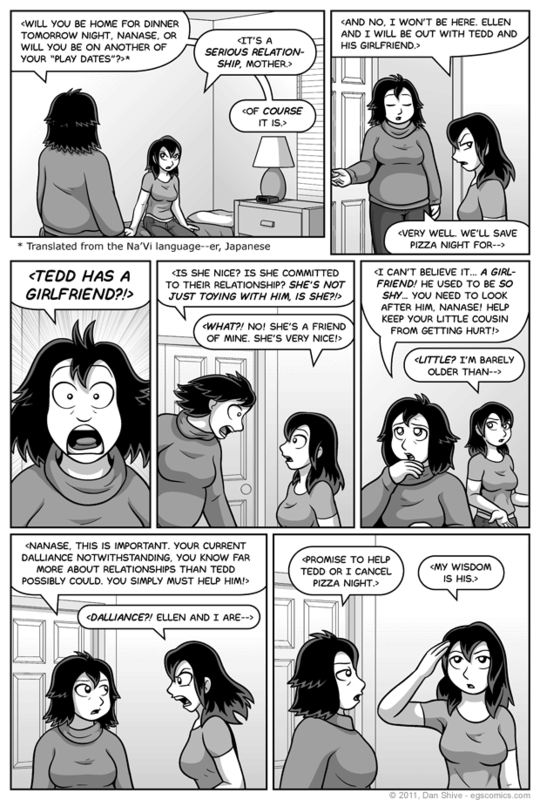 It may be difficult, but I believe it is possible to extrapolate from the evidence who her sympathies were with when Tedd's parents got divorced. This is one of... Wait, no. This is the ONLY comic in this storyline that has wound up getting heavily rewritten so far, mostly because the original setup was Nanase asking her mother for an advance on her allowance due to discovering that bowling was going to be more expensive than expected. That set up was a bit of a stretch given that she and Ellen were already talking about going to the movies (aka the "cinema money pit"), and if Nanase was going to ask anyone for extra money for a date with Ellen, it would be her dad. We haven't seen much of him, sure, but Nanase has always been specific about her mother being the one who objects. All that, and it was simply a lengthier set up. So, yeah. The ultimate point of this comic remained unchanged, but it got rewritten like ka-RAZY all the same.